I don't need to be convinced that grapes are good for you. I mean, I'm French, I practically grew up with wine in my baby bottle! But beyond having the power to turn a boring date into a fun night in their fermented form, grapes are also loaded with beneficial substances: antioxidants such as phenols, including the well-known resveratrol, that fight free radicals, one of the main causes of aging. 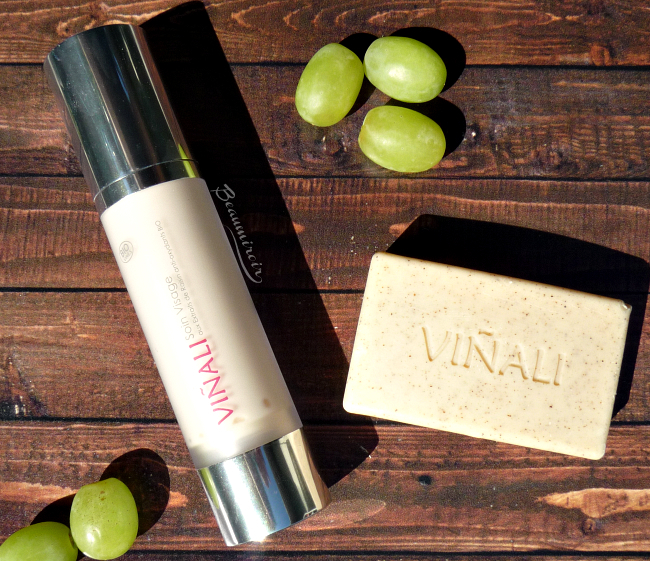 Using grape extracts in skincare has been done before - I'm sure you've heard of the French pioneer brand in that sector, Caudalie - but there's a new player that goes one step further, called Viñali. 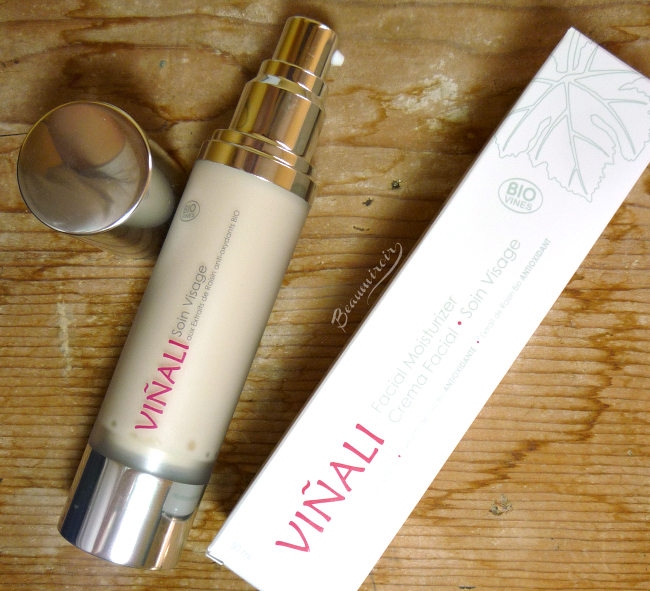 Viñali was founded in Spain through the collaboration of a family of winemakers and a French woman entrepreneur with experience in skincare development. 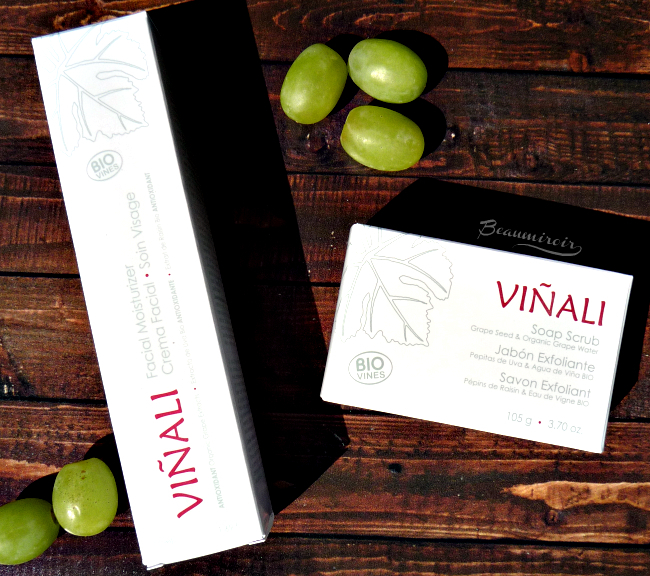 What makes Viñali products different is that the brand has replaced plain water, often the first ingredient in skincare, with organic grape water in all their formulas. It means that instead of the main ingredient of your face cream being filtered tap water, basically, you get a product based on naturally extracted organic fruit water, rich in minerals, nutrients, essential oils and antioxidant resveratrol. Beyond fruit water the cruelty-free brand pairs their organic grape extracts with other high-quality natural ingredients, often organic, such as sweet almond, jojoba, wheat germ oils, chamomile, ginger or hibiscus to create effective vino-cosmetics skincare with a luxurious sensory aspect. It may sound a bit too good to be true, but you just have to take a look at the ingredients lists for their products to realize how impressive they are! I stopped using scrubs (ie mechanical exfoliants) on my face more than 5 years ago, so I used this one on my body rather than my face. - The Soap Scrub's formula is 98.95% natural and 83.90% organic, which is VERY impressive. I explained to you recently why a skincare product labelled "organic" sometimes contains only 10 or 20% actual organic ingredients, but this one really deserves its certification! The scrubbing particles are grape seed powder, and beyond the classic ingredients of a gentle soap, it contains grape water, olive oil, and grape leaf extract. - It has a nice, slightly fruity scent which is very light and pleasant. 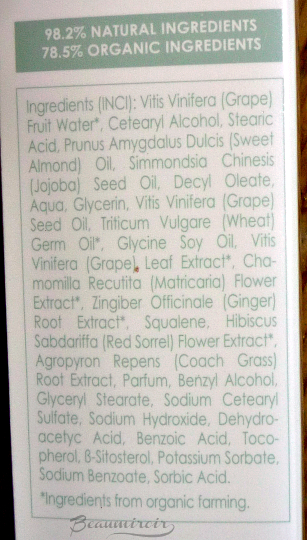 To be noted, there is a good amount of fragrance in this soap (in the first half of the ingredients list), and I wish the brand would replace it with a natural scent from essential oils to be more consistent with their natural approach. - It feels very gentle and it's absolutely not drying. I tend to have dry skin on my body, and this Soap Scrub didn't make me dryer at all. I would say that the exfoliation is mild: in order to really feel it I have to rub the bar directly onto my skin. It also doesn't produce much lather, which is actually good news since lathering agents tend to be irritant. When choosing your soap or cleansing gel, always keep in mind that more lather doesn't mean cleaner! The substances that cause foam to form are not the same as the ones that cleanse the skin. In fact, the most gentle cleansers produce no lather at all. Based on the ingredients I wasn't sure that this moisturizer would work for me, but it completely took me by surprise and I can say it's one of the best skincare products I've discovered in months! - The Facial Moisturizer comes in an airless pump. It's convenient, sanitary, and it preserves the fragile antioxidants the cream contains. Plus the frosted transparent body is really classy. 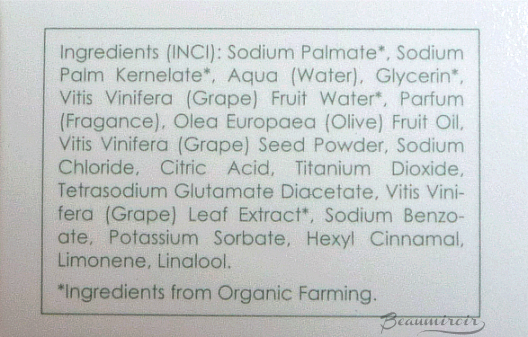 - Again the ingredients list is incredibly impressive, with 98.2% natural ingredients and 78.5% organic ingredients. Just take a look for yourself! It's loaded with plant extracts yet cleverly avoids the sensitizing fragrant ones. - Because it contains so many plant oils, I was concerned that it could make my skin oilier, or looking greasy, but it absolutely doesn't! Despite all the nourishing ingredients it leaves my skin satiny and soft, not sticky at all, and it doesn't look or feel oily in the least. - It's a rather thick cream that feels rich and cushy, however it is completely absorbed very quickly, leaving no residue. It's pretty amazing for a nourishing formula that contains no silicones to feel so weightless and silky! 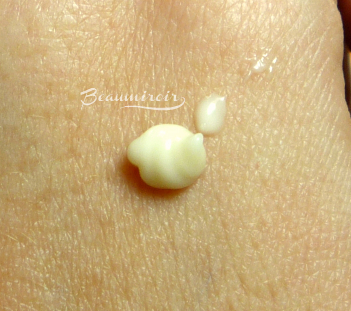 In terms of texture this moisturizer is really at the same level as any high-end brand (better than most, actually). - I've been using it at night for about a month now, and it clearly improved my skin's moisture levels. Well hydrated skin looks healthier, more radiant and less prone to fine lines, so that's what I get when I wake up in the morning! It's impossible to judge the anti-aging properties of antioxidant creams within a short period of time, but I'm confident that the beneficial ingredients are doing good to my skin while it repairs itself at night. As long as it captures free radicals, it's preventing future damage! I'm truly impressed by Viñali's remarkable skincare formulas, packed with good plant extracts with nourishing and antioxidant properties. Their idea to substitute water with organic grape water is as simple as it is brilliant. If you want to transition to natural and organic cosmetics but are not ready to give up luxurious textures and high-end packaging, I strongly recommend the Facial Moisturizer! Do you use natural or organic skincare? What factors are important in your choice of skincare products? 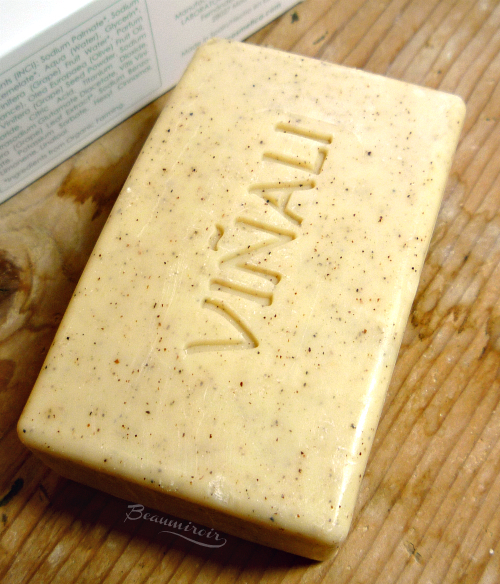 At this time you can find the skincare range online on Viñali's website, and the brand has also just started selling on Amazon. Prices are very fair for skincare products of this quality ($14 for the Soap Scrub and $58 for the Facial Moisturizer). The product featured in this review was sent by the brand for consideration. I received no compensation other than a free sample to write this post, which only reflects my personal opinion. This post contains affiliate links.